For painter Tom Nozkowski and sculptor Joyce Robins, abstract artists whose work is rooted in the tangible, the world is a complex spider web of interconnections. Both have a predilection for melding the grid with wilder, more primal qualities that put austerity on defense. As Nozkowski once said of his work, “If a painting would seem to have a source that is anthropomorphic or organic […] start geometrically. If a painting has a source in a city and architecture in the urban, let’s do it with curves and juicy paint running all over the place.” 1 A painting like Untitled (P-65) (2009) really captures this notion. A blue and white mesh latticework of paint covers the canvas, interrupted by an amoebic swirl of gray that cuts through its center. The swirl is edged with brightly colored circles. Nozkowski marries the playful to the severe with these bubblegum balls that further upset the rigidity of the grid. 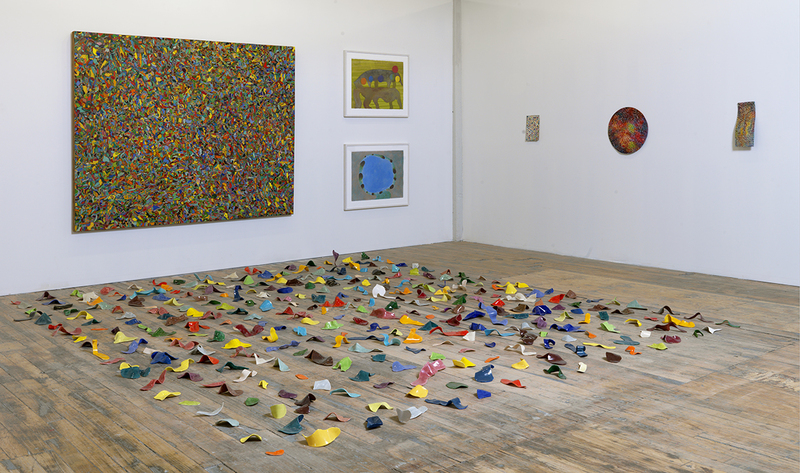 Tom Nozkowski and Joyce Robins, installation image. Courtesy of the artist. Photo by Brian Buckley. Brilliance is also a facet of Robins’s sculpture, as in her Red Disk (2011). The circular, wall-hanging sculpture of glazed clay teems with a spectrum of colors that range from aquamarines and grass greens to red umbers and moody grays. The different hues melt into each other seamlessly, transfixing the eye. Impressed into the clay are hundreds of small holes, which are a frequent motif in Robins’s work. She has said they refer to ancient finger markings that she once saw on the walls of a painted cave in the French countryside. These primitive fingerprints left a profound impression on Robins, for they represented a connection between humanity’s ancestors and the present. Robins’s work likewise extends its hands across time to both past and future generations, and asks for a connection. 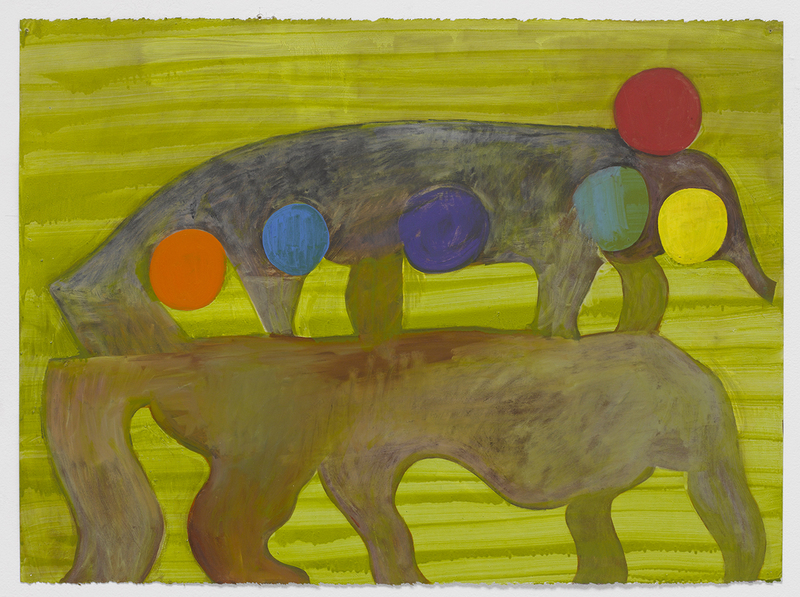 Thomas Nozkowski, “Untitled (L-5),” 2009. Oil on paper, 22 x 30″. © Thomas Nozkowski, courtesy Pace Gallery. Photo courtesy Pace Gallery. John Yau, “In Conversation: Thomas Nozkowski with John Yau,” Brooklyn Rail, (November 2010).